When the San Francisco 49ers sent a second-round pick to the New England Patriots last season for the now 26-year-old Jimmy Garoppolo, their wildest dreams were imagined. 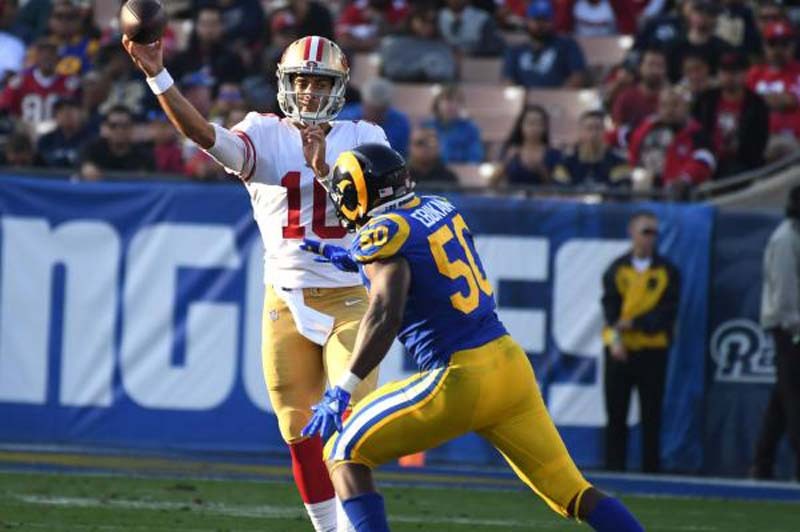 The team got what it is banking on to be its franchise quarterback after he went 5-0, throwing for 1,560 yards, seven touchdowns, five interceptions and a 67.4 completion percentage down the stretch in meaningless games after the 49ers were all but out of contention. In response, the 49ers rewarded Garoppolo with a five-year, $137.5 million deal, the richest in NFL history. Now, with a full offseason to prepare in head coach Kyle Shanahan's system, it's time for Garoppolo to live up to the lofty expectations. "As the quarterback, you want to be able to answer any question that is asked to you," Garoppolo said. "You want to, if you get put in a tough spot on the field, be able to get the team into the right play. "Last year, not that I was handcuffed, but I just didn't know some of the reasons of why we were doing things. It was just kind of get this by Sunday and we'll tell you everything else in the offseason type of thing. I think learning the why's has definitely helped me. I still have a long way to go. We're not even through OTAs yet. It's a work in progress, but it's coming along." The expectations, even is a little unrealistic, have Garoppolo and the 49ers excited for the upcoming season. He has even had a chance to explore the Bay area a bit. "People are really looking forward to the season," he said. "A lot of excitement in the air. Really getting to know certain areas of the Bay a lot better, which is cool. I never got to do that last year. I was pretty much here 24 hours a day. It's nice to get out and experience some of it." With the position he plays, not to mention the massive contract, the 49ers are counting on Garoppolo to lead the way this season, especially after being a part of the offseason program. "Last year, I didn't know everyone's name so that was tough to begin with and then I'm trying to learn everything week by week," he said. "It was a whirlwind last year, but now that things have slowed down, I feel more comfortable in the environment and getting more and more used to everything. It's a great situation. I love being here. I think we've had a good OTAs and we're working hard right now." And about those loft expectations, Garoppolo is quick to point out it is still early and the team is just taking it day by day. "I think we've got to have a strong finish to these OTAs first (before we start talking playoffs," Garoppolo said. "People always like to talk about the predictions with the season. Even when the season just ends, they start talking about it. It's all noise on the outside, but I think we have a good group that is locked in right now. We're focused on OTAs. We'll go in to training camp, hopefully have a good training camp and take it day by day."